Rode Trip arrived in Rockland for the tail end of the 66th annual Maine Lobster Festival. We anchored in our favorite spot, the southern end of Rockland Harbor, and had just enough time to hang our wet gear (oh, yes it was a lovely motor against the wind from Islesboro through fog and intermittent downpours) and cook a quick supper before starting our own festivities aboard Rode Trip. One year ago in this very anchorage we met friends, Dennis and Candace; this night we welcomed them aboard our home. Dennis brought along a most excellent homebrewed stout and we toasted our return to Maine! Soon, Scott and Kim joined from s/v Anthyllide and we introduced everyone while passing a batch of Kim’s tasty chocolate-everything cookies. From shore we could hear the Saturday night highlight artist of the Maine Lobster Festival, David Cassidy. Every once in a while Dennis would tap along to the beat or sing out the words to a refrain and Scott, Kim, and Candace would laugh while they all agreed or disagreed on whether the song was David Cassidy’s or the Partridge Family. Brian and I sat grinning trying to determine if we’d ever heard the songs being sung. We had no idea why the Partridge Family was pertinent because we were pretty sure it was a TV show…but we tried to keep our lack of pop knowledge on the down low. We were glad to have live music in the background without paying the ticket price for the concert. It was a great night in the harbor. The next morning I could barely contain my excitement as we anticipated the arrival of our friends from New Hampshire. I was starting to run out of things to keep me busy around the boat (because I woke up way too early) when a text finally announced, “We’re on the way…” Within the hour we were jumping for joy and sharing hugs with Sunny, Berkley, and baby-to-be! They spent a few days visiting with us in Rockland. 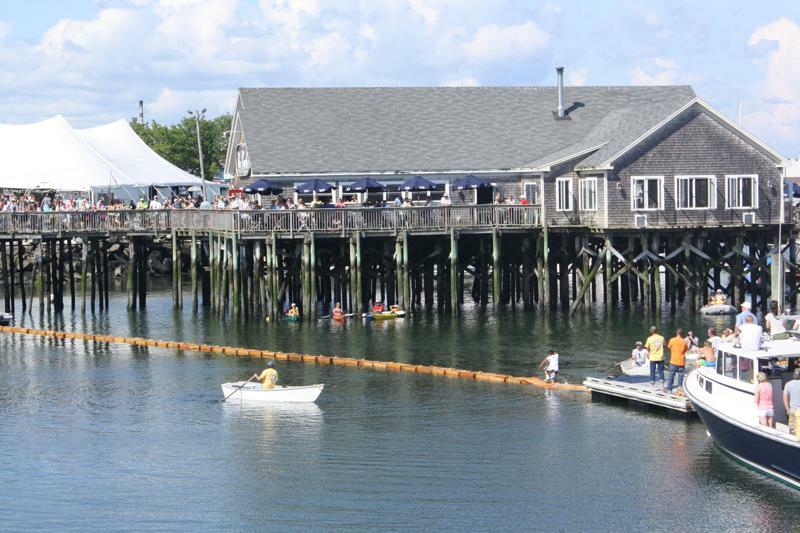 First on our agenda was the Maine Lobster Festival; it was the last day, FREE admission! 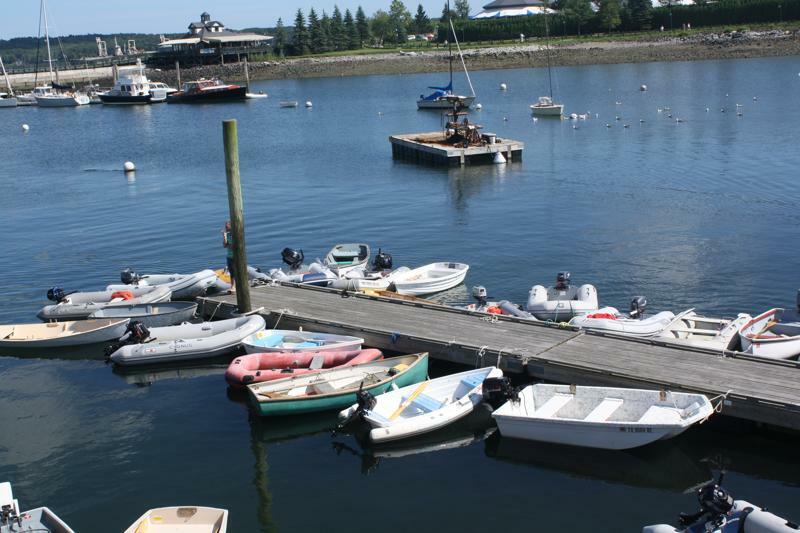 We squeezed into a parking space at the dinghy dock where we had a great view of the lobster crate races which were just starting. Children were jumping, sprinting, and hopping across the line of lobster crates to see how many crates they could cross – total – in either direction prior to falling off into the water. This was a most impressive event! 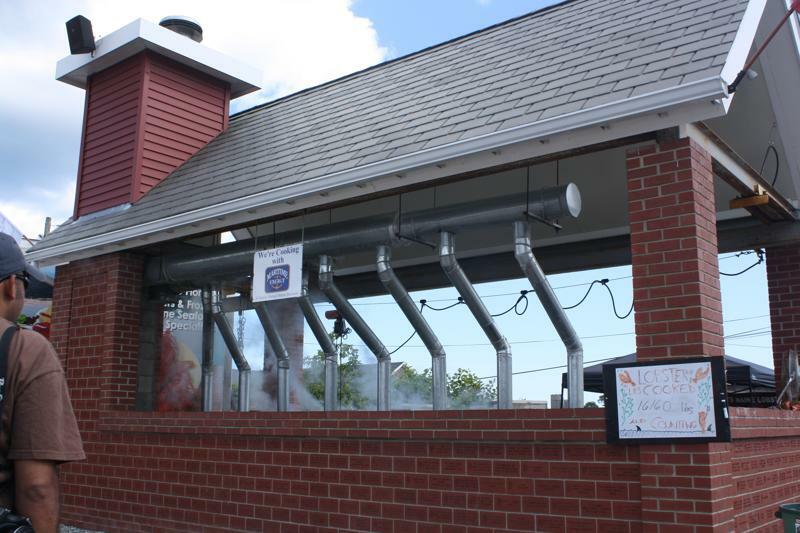 16,160 pounds of lobster have been cooked…and still counting! Arrrggghh…hand over those lobsters, Matey! 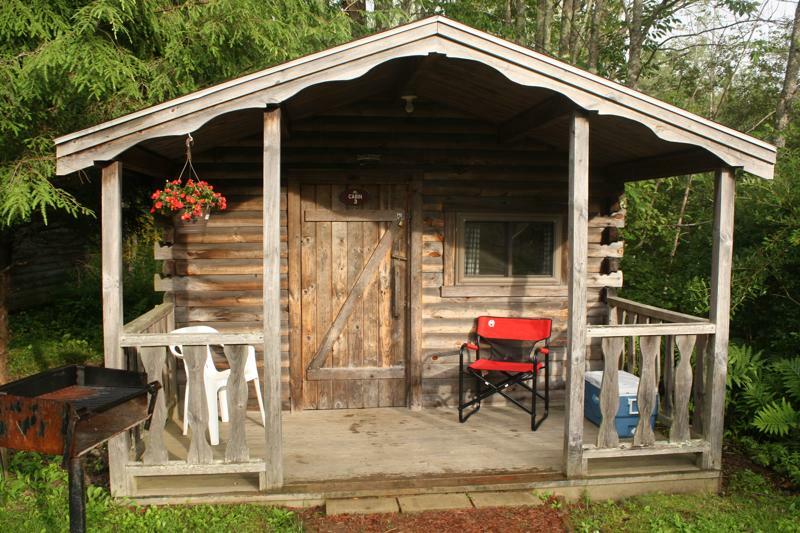 Once we’d had our fill of funnel cake, deep fried Oreos, and root beer (the real lobster feast comes later) we headed to the nearby campground where Sunny and Berkley had reserved a cottage for their mini-vacation. Adorable! We settled in for a night away from home. As we had done all day long, we continued to talk long into the evening while we grilled dinner, roasted dessert, and tipped back a few cold ones in between. 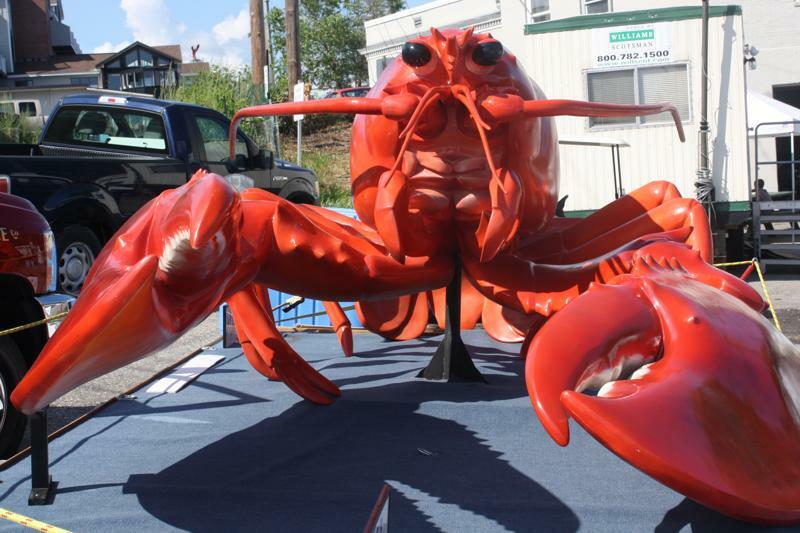 This entry was posted in Uncategorized and tagged David Cassidy, everything lobster, Maine lobster festival, Rockland by stephanie. Bookmark the permalink. I can fill you in on David Cassidy, since I saw him in concert when I was 11years old and loved watching The Partridge Family on TV in the early 70’s. Shirley Jones was the widowed mother, David Cassidy was the oldest son, Susan Dey was the oldest daughter and there were 3 more kids. They had to make money to live, so they sang as a group and they had a manager as a side kick. It’s something that he’s still singing. That would have been to great, for me anyway, to hear the old songs. I read your post and started laughing to realize you are TOO YOUNG to know about them. What fun! PS. Where are you going this winter? Hi Lorraine, thanks for enlightening us on David Cassidy and the Partridge Family! Winter plans are still brewing…but we will be in the Bahamas playing charter boat with a few good friends.